During more than half a century of history, Pratic has always been the protagonist of an evolved connection with the outdoor environment. This has allowed it to create innovative solutions such as pergolas, structures that have totally revolutionized the way of experiencing outdoor living spaces. No more boundaries between inside and outside, but rather an uninterrupted connection that links two worlds to live freely in private housing and contract spaces. The genesis of Pratic pergolas stems from this assumption, continues with an unmistakable design and is completed by the ability to create a simply perfect Made in Italy product. 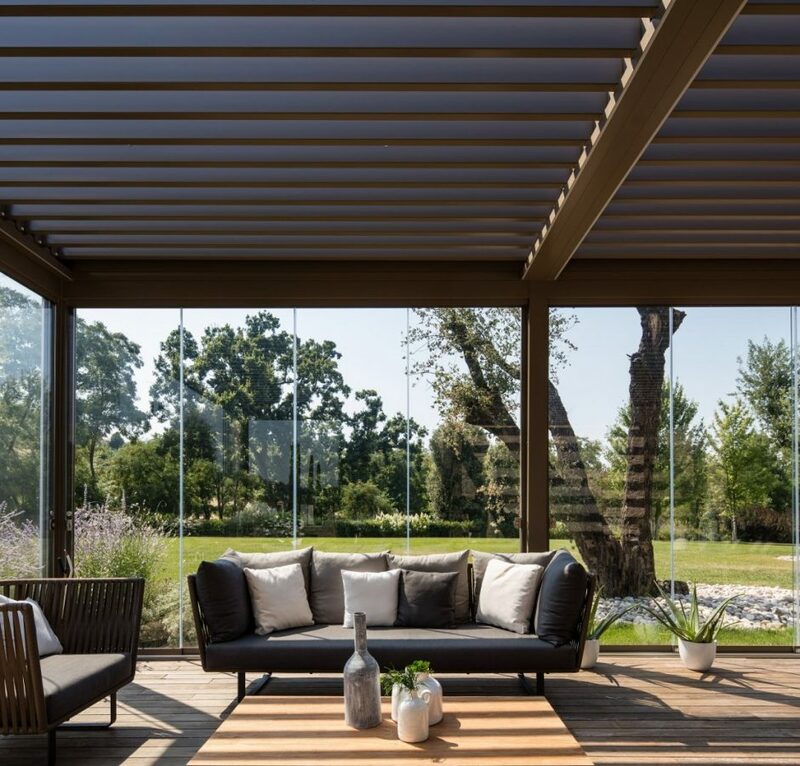 Inspired by the most ancient sheltering structures of the Mediterranean world, today, pergolas create new spaces enjoyable all year round, creating new volumes, valuable brightness and incomparable comfort. Pratic aluminium and wooden pergolas can be installed anywhere since they are designed with the aim of enhancing every architectural context. They have maximum flexibility, in fact, they are available in the self-supporting version as well as in the wall-mounted version, harmoniously inclined or positioned aligned with the horizon. Large green spaces can be sheltered from the sun thanks to Pratic garden pergolas, which are installed on their own or combined with multiple modules. Pergolas for terraces also give new life to outdoor patios and city rooftops, which can be used all year round. Their structuring meets resistance and lightness requirements, even in climatic conditions with significant temperature changes, salty air or constant wind. Aluminium, wood and steel are chosen carefully before being employed in the structure, which is completed by the ideal covering based on the chosen model. 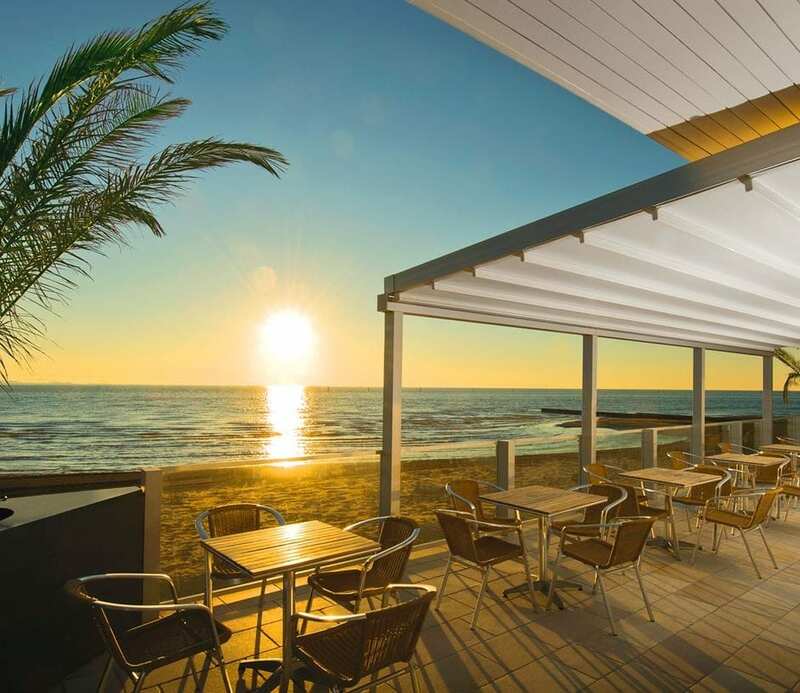 The coverings range from PVC shading and waterproof canvases to pergolas with fabric awnings that provide sophisticated shade: a wide top-quality range that has quick and simple automated movement. The bioclimatic pergola is instead characterized by its rotating adjustable blades that create the desired climatic condition. In this case, movement is also automated and silent; just a few minutes are needed to lift or fold the blades, using the external elements such as wind and sunlight in a completely natural manner. The is no limit to your customization wishes thanks to a colour palette with thirty-eight colours, created by fashion and design experts. All Pratic elements are individually painted within the company, with a cutting-edge system for quality and eco-sustainability. The powders used ensure brilliance and greater resistance to UV rays, salt and humidity. In order to remain eco-friendly and value human health, and the powders are almost 100% recoverable. 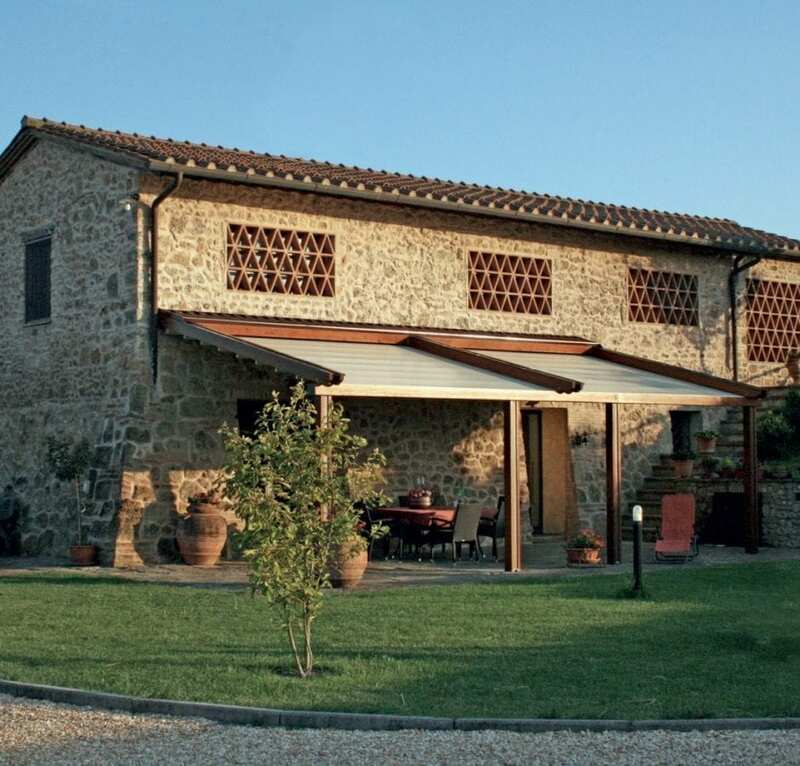 All Pratic pergolas are Made in Italy, designed and manufactured in the headquarters of Fagagna, Udine. Essential design and advanced technology are the new frontier of outdoor bioclimatic architecture, for exploiting the outdoor environments of private homes and contract spaces throughout the year. Pratic bioclimatic pergolas are characterized by special aluminium sunscreen blades that can rotate up to 140 degrees. It’s an easy way to obtain the ideal lighting and wind conditions and to recreate natural climatic comfort inside the structure, which also shields from rain and snow. Eleven structures that integrate into any architectural environment of both private homes and typical contract spaces. 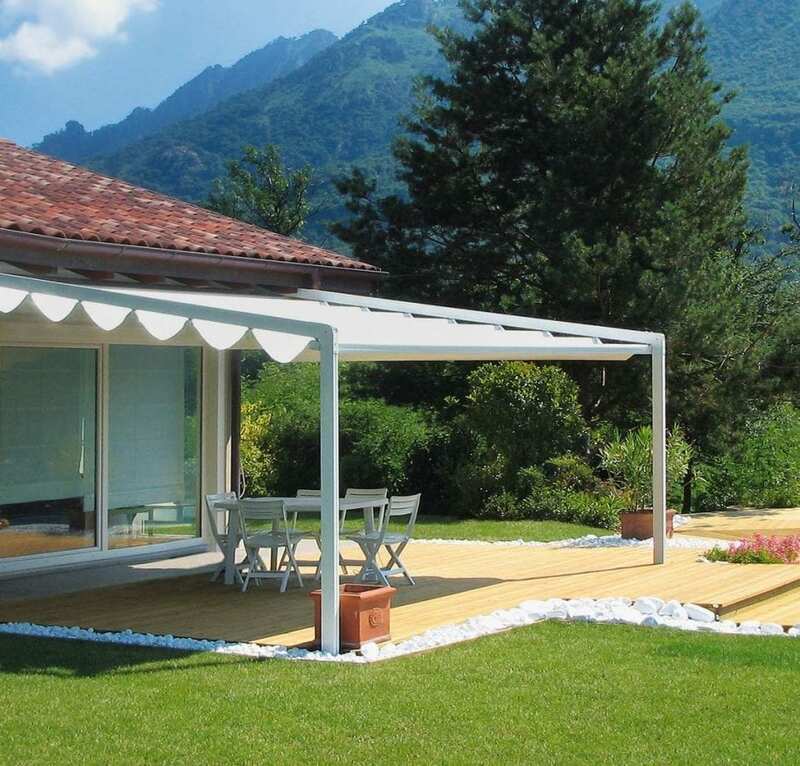 Functionality, comfort, beauty and resistance: the essential design and broad range of pergolas with PVC canvas are able to solve every designing need. Customization is made simple by modularity, side canvases and by perimetral closures, for easy use even when the weather isn’t optimal. The wooden pergolas combine classic beauty and functionality and are enhanced by an essential design. The support structure, made of laminated Nordic pine, comes complete with a covering system, chosen according to the type of protection you desire. Automation and accessories complement an elegant and always comfortable outdoor experience. Elegant and essential, Pratic sun covers are a blendof style, quality material and innovation. Due to their versatility, they can be installed in any architectural context, always guaranteeing top performance in terms of function and resistance. Automated movement, LED lighting and the extra features, make any environment adorned with Pratic covers comfortable and beautiful.